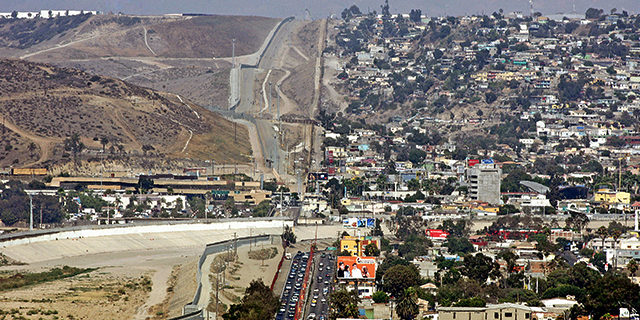 Amid tense relations between the United States and Mexico, one of the factors affecting the way Mexicans and Americans view each other is proximity to the border. 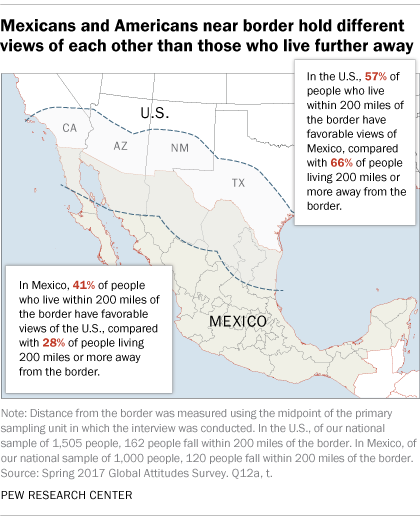 But border-dwellers in the two countries don’t lean the same way: Americans living in parts of southern California, Arizona, New Mexico and Texas are less favorable toward Mexico than Americans further from the border, while in Mexico those near the boundary between the two countries are more positive toward the U.S. than other Mexicans. Nearly six-in-ten Americans (57%) living within 200 miles of the border hold a favorable view of Mexico, compared with 66% in other parts of the U.S. The reverse is true on the Mexican side: 41% of Mexicans who live within 200 miles of the U.S. border have a favorable view of the U.S. compared with only 28% of those who live further away. In the U.S., border proximity matters even when controlling for political party affiliation. Overall, however, party support does play a significant role in how Americans view Mexico: 78% of Democrats have a positive view of Mexico, compared with less than half of Republicans (47%). These partisan differences have intensified in recent years: In 2010, 58% of Democrats and 48% of Republicans viewed Mexico positively, resulting in just a 10-point partisan divide. Proximity to the border does not matter when it comes to views about U.S. President Donald Trump’s proposed border wall. Only about one-third (32%) of Americans near the border and 35% of those living further away from the border approve of the proposed wall. Mexicans are overwhelmingly united in opposition: Only 3% of Mexicans within 200 miles from the border and 5% of Mexicans further from the border approve of Trump’s plan. In general, American views of Mexico have remained quite positive, despite frictions between the U.S. and Mexican presidents. In fact, the percentage of Americans with a favorable opinion of Mexico is up 12 points since the last time this question was asked in 2010. 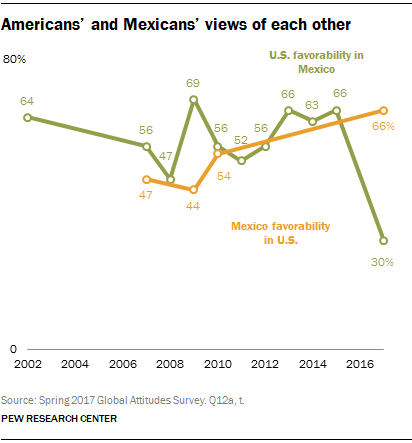 But Mexican views of the U.S. have deteriorated, plunging from 66% favorable in 2015 to only 30% favorable in 2017. Hanyu Chwe is a research assistant focusing on global attitudes at Pew Research Center.